The La Costa area of Carlsbad (link is to a virtual tour of Carlsbad - ALSO see lifestyle tour of La Costa BELOW), in zip code 92009, is one of the better known residential areas along the North San Diego County coast, and a popular Carlsbad neighborhood. La Costa began growing in 1965 when several thousand acres of land were purchased and turned into a golf course (now part of the Omni La Costa Resort and Spa), homes were constructed, and the Rancho La Costa Inn was built for visitors. The original resort has had several owners and was later renamed La Costa, thus giving the surrounding residential area its name. 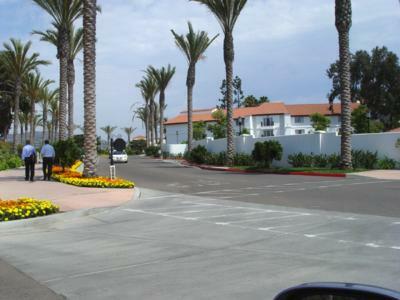 Formerly a separate "town" La Costa was later annexed and became part of Carlsbad, but most people refer to it by its original name. In the early days La Costa and the famed resort had a reputation as a playground for the rich and famous, many from Hollywood, the Rat Pack being the most well-known. A number of celebrities had homes here along the golf course (Robert Young, for example) or rented properties in the area. Despite several changes in ownership, the resort remains a popular golf, tennis and spa destination and hosts several golf and tennis tournaments annually, as well as weddings and corporate functions. The resort developed a series of whole ownership condos, the La Costa Villas, on the grounds which have proven to be wildly popular, and expensive (averaging $600/SF and more and usable 120 days out of the year - owners can rent them the remainder of the year for income). Omni La Costa Resort and Spa (the name was changed from the La Costa Resort and Spa in 2014 after being acquired by Omni Resorts) is also the site of the Chopra Center, developed and owned by Dr. Deepak Chopra, internationally known for his spiritual teachings and alternative medicine. The La Costa real estate market covers a broad range of housing options in many styles, including apartment rentals, condominiums, and detached homes, many with reasonably large parcels of land. High-end properties tend to be gated, and there are a number of small gated condo communities along the golf course. Many of the single family detached and condo properties adjacent to the resort are second homes and investment properties. Because of the hilly terrain, many La Costa homes offer panoramic and beautiful views of the Batiquitos Lagoon, the ocean, the La Costa resort and golf course, and the back country hills. Proximity to the resort and to the beaches make this area a prime vacation and rental market. La Costa homes range widely in style, size and price, and inventory varies depending on the overal market and economy. In 2007 when this article was first published condos typically ranged from the $200,000s and up, and single family detached homes generally are priced beginning in the $500,000s to well into the millions for properties high on the La Costa hills with amazing views such as in the photo to the right. Looking at prices in 2017, you'll be hard pressed to find a single family home for less than $550K - $575K, with most well more than that, and condos generally start in the high $200s. In general prices, on average, are less than neighboring Encinitas to the south, and the Aviara area of Carlsbad, to the west nearer the ocean, and homes tend to be larger for a comparable price. Regardless of budget, the La Costa residential area remains a popular option for primary, second and investment home buyers. Depending on where you live, and the current geographic boundaries, La Costa children may go to different school districts. Part of the area is served by San Dieguito Union High School District (Encinitas) and the Carlsbad Unified School District; others attend schools in the San Marcos School District. The La Costa neighborhood offers an idyllic Southern California lifestyle, given the area is primarily residential, has beautiful views, and experiences a very pleasant coastal climate all year round, with abundant amenities and services nearby. There are two small shopping centers as well as upscale shops at the resort. 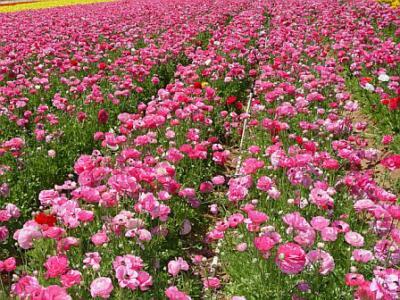 Nearby shopping of every description, however, can be found along El Camino Real, a major thoroughfare running north and south from Oceanside to Cardiff. 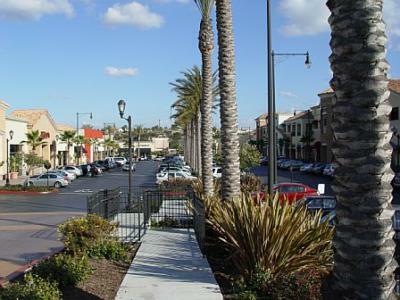 The Forum (below left), in South Carlsbad is probably the best known upscale shopping area, but La Costa residents also have easy access to the Carlsbad Premium Outlets Mall to the north, as well as other smaller strip malls along El Camino Real and further south in Encinitas. A newer mall, La Costa Town Square (La Costa Avenue and Rancho Santa Fe Road to the east) opened in late 2014. With regard to travel and commuting La Costa is close to the 5 freeway, without the noise, so travel to downtown San Diego (about 30 miles) and to LA (about 100 miles) is relatively easy except during rush hour traffic. There are few restaurants in the community itself, the best being at the Omni La Costa Resort (e.g., Bob's Steak and Chop House, Bistro 65). However, residents can enjoy upscale dining close by in other areas of Carlsbad including Carlsbad Village, at the Park Hyatt Aviara Resort nearer the coast, and in Encinitas. Vigilucci's in Carlsbad offers water-view dining and extraordinary sunsets, at the corner of Tamarack Avenue and the Coast Highway. 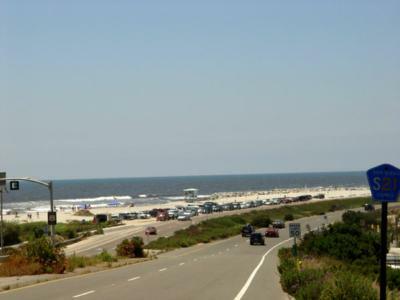 Nearby attractions for residents include miles of Pacific Ocean beaches (South Carlsbad State Beach - photo above right, off coastal Highway 101 to the west), camping facilities, the Flower Fields (off Palomar Road, top right photo), the Museum of Making Music, Legoland, and the Leo Carrillo Historic Ranch Park in Rancho Carrillo to the north. 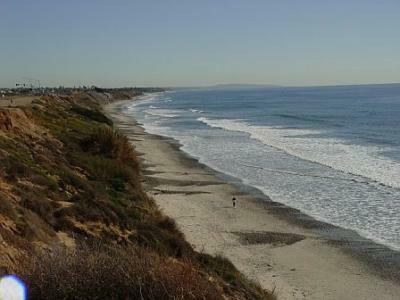 If you are searching for that special Southern California home near the ocean, with golf, tennis, shopping and restaurants in and around the area, in a primarily residential community, but with easy access to the city and other coastal amusements, then the La Costa area of Carlsbad may be the ideal choice for you. The diversity of La Costa homes offers many options for first time, move-up, downsizing, and vacation-home buyers, and with a broad range of prices. And for those of you living in other parts of the country, relocation to La Costa may give you the year-round lifestyle you are seeking, away from the cold and snow.I have a lot of experience, personal and otherwisse, with relocation, so I can help!! 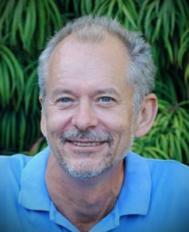 Also check out my video series on Relocation Tips and Advice. By the way, I lived in La Costa very close to the resort for 5 years and know the area very well, so I can provide you with much more information and photos of the area if it appeals to you. I'd love to hear from you if I can assist in any way or you have any questions about what it's like to live in La Costa, in South Carlsbad CA. Please feel free to contact me at (760) 840-1360 or via email at jeffdowlersolutions@gmail.com so we can discuss your housing needs and budget and work on a strategy to get you into the home of your dreams in La Costa.